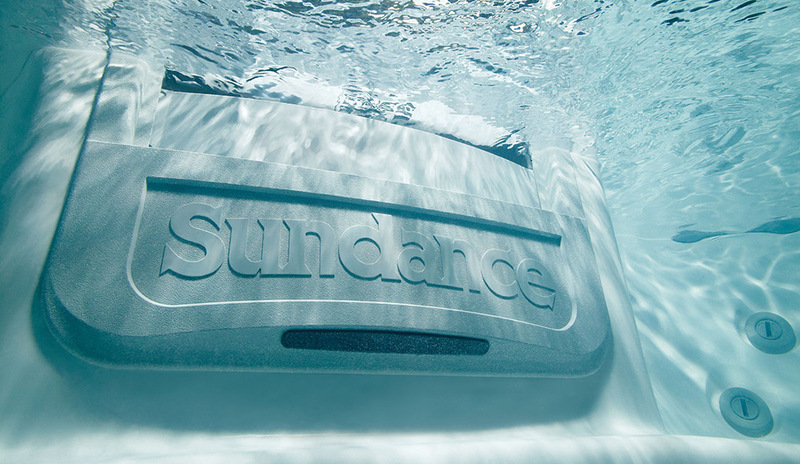 All of Sundance® hot tubs and spas come pre-equipped with the best cleaning set up in the industry. Our CLEARRAY™ Water Purification System delivers the clearest, cleanest water through UV-C technology. Over 99% of pathogens are destroyed with this cutting-edge feature, all without inundating your water with further chemicals, gases, or other byproducts that can irritate your skin and eyes. In our laboratory testing, we found that our system reduced the amount of sanitizer needed by 50%. This is good news if you’re allergic to chlorine or bromine in your water sanitizer, of if you’re looking for the simplest, most efficient way to keep your tub hygienic without added maintenance. Since 2012, our signature CLEARRAY™ system has been installed in our products, keeping your hot tub cleaner and your life simpler. Even if your hot tub is older, you can still enjoy this level of improved performance and sanitation. Hot tubs manufactured as far back as 2006 can be retrofitted with our CLEARRAY™ aftermarket kit. Convenient to install, CLEARRAY™ replacement bulbs are also available to maintain the performance of your water purification system. You’ll be able to keep your spa cleaner and enjoy the clear, pure water for years to come. Download our free brochure to learn more, then visit one of our localSundance® Spa dealers to find our kits, filtration supplies, spa covers, and other accessories. Whether your tub is new or you’re the proud owner of a slightly older home spa, you can enjoy fresh, clean water with minimal effort by using quality Sundance® Spa products. The CLEARRAY® system uses UV-C technology to neutralize 99.9% of waterborne pathogens and does not introduce gases, chemicals, or other byproducts into the hot tub water. CLEARRAY® will also reduce the amount of sanitizer you use in your hot tub*, which means less skin irritation and eye irritation for bathers from chlorine- or bromine-based products. No more drying out, no more red-eye. New for 2012, the CLEARRAY® Water Purification System is standard on all Sundance® Spa models. (If you have an older hot tub but want the newest technology in the water purification category, you’ll want to purchase the CLEARRAY® aftermarket kit. Retrofittable to 2006 models.) Canadian residents click here. *Our laboratory testing has shown that CLEARRAY® can reduce your sanitizer usage up to 50%. Always refer to your state or local government agency standards and regulations on how to maintain your water chemistry. An annual bulb replacement is required with CLEARRAY® Water Purification System to maintain optimum performance. SUNPURITY™ PLUS Water Enhancer is an effective formula that works hard to help keep your spa water clean and balanced longer. Use in conjunction with your current water management system for clean, clear water.